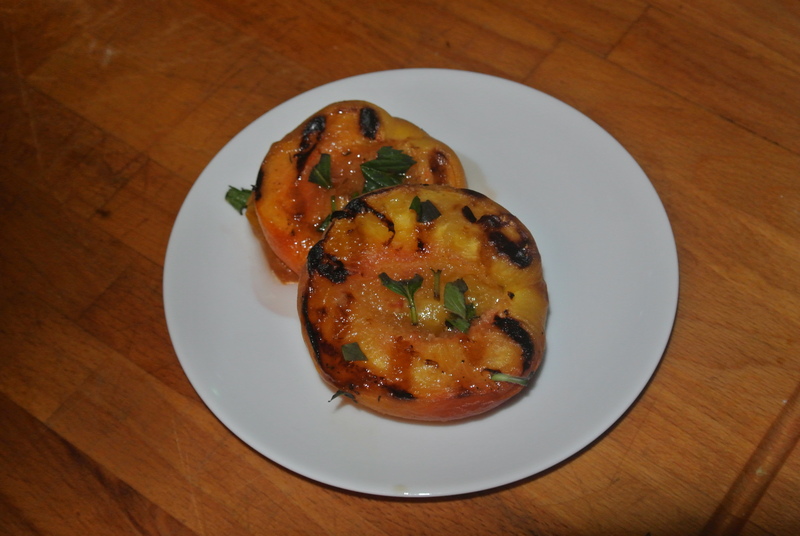 Grilled peaches drizzled with local honey and topped with some chopped organic mint. Today’s food tip: Don’t shy away from grilling fruit. I got some peaches at the local farmer’s market over the weekend (it’s Buy Local Challenge week!) and they were a little under-ripe. My grill to the rescue! I halved and pitted the peaches, brushing the halves with a little coconut oil. Coconut oil is light in flavor, has a high smoke point, and is better for us than vegetable oils. I placed the peaches cut side down on the grill over low heat, allowing the fruit to develop those gorgeous grill marks. I finished the fruit off by setting them cut side up on the upper rack of my grill while the rest of my dinner cooked. The fruit ends up tender, juicy, and the sugars develop beautifully. Pull them when they are fork tender and top with caramel sauce, honey and mint, a squeeze of lemon, or even some aged balsamic vinegar.